Do We Have A Striking Gem Under Our Noses? Gareth Bale! The kid scored a hat-trick when in Italy against one of the biggest teams in the world, all this from the left wing which has got me and a few other Spurs fans talking and we have asked the question, if he can do this much damage from the left wing then what would he be like if we gave him a game up front? Maybe I am well off the mark, maybe he wouldn’t have as much of an impact as a lot of his goals come from beating a man down the wing and creating his own chances. Strikers need natural instinct to get in the right positions in and around the box. Could Gareth do all this? I don’t know about you guys but I think it’s time Crouchy was used more as an impact sub rather than our main striker, he just isn’t cutting it at the moment. So would it really hurt to give Bale a chance at playing up top with Pav or could he even manage a game up top on his own with Van der Vaart just behind him? If not then maybe Harry should consider giving Van der Vaart a chance up top as a main striker until Defoe returns. I really would like to see Bale given a chance, I wouldn’t like to see him take this role up full time because left wingers are hard to find. Wales sort of give him a free role sometimes and even play him on the right but it doesn’t seem to bother Bale where he plays he always seems to do a job. I think we have established by now that although he could be a good left back he is far better doing forward, anyone who can score a hat-trick against Inter Milan should not be playing at the back in my book. I have been doing some thinking, if Wesley Sneijder really does want to leave Inter and the rumours are that he might be looking for a way out with Manchester United keen on landing the Dutchman, could we possibly sign him? To me it makes perfect sense, the guy is best mates with Van der Vaart, same age, same nationality and good friends, surely Van der Vaart could talk Wesley Sneijder into a move to Tottenham should he want to leave Inter. Both them two players in our midfield would make us the dogs. Wesley Sneijder and Van der Vaart played together in the World Cup Final this summer before Van der Vaart moved to Spurs on deadline day. The pair previously played at Real Madrid and Ajax together. If Rafael is happy at Spurs then hopefully he could put in a good word for Harry. It makes perfect sense to me. OK so I am living in a dream world, but stranger things have happened and if Wesley Sneijder ever does become available then I expect there’s a good chance that Spurs would be in the running for his signature if the price is right. Wesley Sneijder will get a chance to play at White Hart Lane next week when Inter Milan come to down and who knows, he might just get a taste for English football and want to trade the San Siro in for White Hart Lane. Sneijder recently turned down a new contract at the San Siro although the Italian giants are hopeful he will accept a renewed offer this week. Can We Beat Manchester United Saturday? My mate at work is convinced we can and will beat United come Saturday which has inspired me to write this as I would like to know the divide on this one. We don’t usually do well up at Old Trafford, the closest we come in recent times was a 0-0 we had when I am sure you all remember Pedro Mendes hit a shot from the half way line which crossed the goal line but was not seen by the officials. Apart from that we don’t usually do well at all, in fact it is one of our worst away grounds since the start of the Premiership. This Saturday live on ESPN we take on United again, it’s obvious that the gap between ourselves and United is closing but are we good enough to give them a real game up there? We are still without key players and ultimately I think that will end up costing us, United are still good at home but it is by no means beyond us to pull off a result. Manchester United have had some problems of late but are getting back on track on and off the pitch, however our boys should be well up for this one. This is what defines teams, this is what shapes the top of the table, how the top four do in head to heads. So let’s have your predictions guys, seriously do we have a chance of beating United Saturday? I am fed up of Manchester United always trying to buy our star players, Carrick and Berbatov are now at Manchester United and if the papers are to be believed then they will be making an approach for Gareth Bale in the near future. There have been rumours that with the United cash crisis that they will try to offload some of their not so good talents to us in exchange for us taking less cash. Michael Carrick and Park Ji Sung are the two names that I have heard. Now surely Sir Alex has a brain and knows that we sold Carrick to him and we do not want him back, Park Ji Sung would add nothing to our team so that is another waste of time. Carrick would do the role of Tom Huddlestone except Huddlestone is now the better player in my opinion. So I have a better deal for Manchester United, how about you sell us Rooney and Nani and we will give you Keane, Jenas and we will even throw in O’Hara as a good will token. How about for a change you take some of our players off us that we actually want to get rid of. We are now a Champions League club just like United and with that means you can’t bully us for our players anymore, if we don’t want to sell Gareth Bale then you won’t be getting him, especially if the best you can come up with is to give us Carrick and Park in exchange, that will only buy you Bale’s little toe on his right foot. 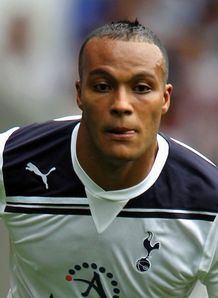 The more and more I see Younes Kaboul play for Spurs the more and more his displays impress me. He seems to be developing and maturing into a fine defender. There is no doubt he still has a way to go but he has all the basics and things that held him back during his first spell at Spurs seem to have been eradicated from his game. I think the Spurs fans first took Kaboul serious last season during that crucial Manchester City game when Kaboul had a fine game and even set up Crouch for the winner. Since then he has played centre half or right back whenever asked by Harry and make no mistake it is not easy changing your position every week. I think he has done this well and can be proud of his performances, he seems to make very few mistakes these days as his maturity to the game is coming to light. “I was very happy to start the game, even though it was a bit difficult because I hadn’t played for a month,” Kaboul said on Spurs’ official website. So what’s your thoughts on Kaboul, are you glad we signed him back off Pompey or would you rather we have left him there, personally I prefer him at right back than Corluka but I also believe that with the right coaching he can even be a very good centre back.